A tagine is a historically Berber dish from North Africa that is named after the type of earthenware pot in which it is cooked. Since I spent about two weeks in Morocco, I’ve been anxious to try making some of the cuisine I ate there. 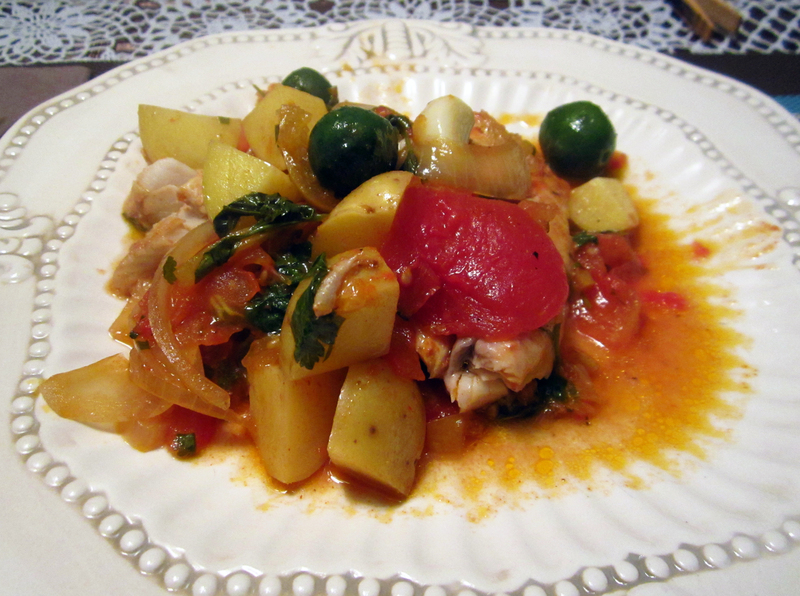 This fish tagine is very similar to one I ate and is so delicious! Use oilier fish for best results. Rinse the fish and pat dry. Place in a ziploc bag and add 1 cup charmoula. Allow to marinate a minimum of 1 hour or a maximum of 24 hours. Preheat oven to 235ºF. Add 1/4 cup water to remaining charmoula. Spread 2 tbsp charmoula over the bottom of a tagine. If you don’t have a tagine, you can use a heavy-bottomed Dutch oven or over-proof cooking vessel. Layer onions around the bottom. Lay 1/2 of the tomato (see note) slices over the onions. Place fish on top. Toss potatoes, carrots and garlic and add to vessel over fish. Add another 1/4 cup charmoula. Cover with remaining tomato slices. Pour remaining charmoula over fish and vegetables. Cut the preserved lemon into quarters. Remove the pulp, rinse the peel and cut into small slivers; cut slivers in half. Scatter over top of the tagine ingredients. Add olives and cilantro. Place the tagine over medium-low heat (use a diffuser if you’re using a real tagine) and bring the contents to a simmer. Cover the dish tightly with a lid or foil. Place in oven and bake for 30 minutes. Check the fish for doneness (it should be somewhat firm). You can continue cooking on the stove top, if you prefer, for another 30 minutes. Note: Before slicing the tomatoes, bring a small pot of water to a boil, then turn off heat. With a knife, make a small X cut on the bottom end of the tomatoes. Dip them in the hot water for about 30 seconds. The skin of the tomato will be easy to remove now. If you can find preserved lemons in the grocery store, you can make your own. Just be sure to make them a month before you need them! Scrub the lemons and dry thoroughly, then cut into from tip to base, stopping about 1/2-inch above the stem end. Turn the lemon and make a similar perpendicular cut. You’ll be left with a lemon cut into quarters, but still joined at the stem end. Hold lemon over a bowl and pour kosher salt into it, packing the crevices in the lemon with lots of salt (about 2 tbsp per lemon). Close the lemon and place in a jar. Pack as many as you can in the jar. Best kind are canister jars with hinged lids and gaskets. The next day, after the lemons have softened a bit and released some juice, use a wooden spoon to push them down. Add additional salt-packed lemons if you have room. Pour enough lemon juice in the jar to cover. Every day for a week, shake the jar to redistribute the salt and turn it over. Refrigerate after a week and wait four weeks before use.